It’s the beginning of a new month, and I’ve just celebrated my 1st anniversary of blogging and tweeting about my work in DFID. I have to say I have really enjoyed it so far. It’s brought Information and Communication Technology (ICT) into my life like never before! 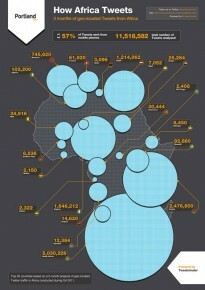 Last week on twitter, this map of twitter users in Africa was all the rage. Almost everyone I follow re-tweeted it. The major fact the map illustrated was just how much South Africa, Kenya and Nigeria tweet compared to the rest. I didn’t find this fact too surprising – the three countries all fall within the top 10 richest and most populous African countries. But the map did leave me wondering about the role of ICT in development more broadly. Most of us these days now think of ICT, and the social media it enables, as a key means of stimulating accountability. When the Presidents of numerous African countries are tweeting, and when websites are launched to monitor aid effectiveness across the developing world, you know ICT is something to take seriously. ICT can also help protect natural resources. Namibia, for example, last year established an SMS hotline to report rhino poaching. There are also many examples of ICT being used in humanitarian situations. Recently, economists have begun to examine the role of ICT in growth. A Mckinsey report suggests that ICT makes up, on average, almost 2% of GDP in several developing countries. Michael Spence, a key author of the Growth Commission Report in 2009, argues that ICT enhances growth because it transfers and builds knowledge. For example, there are now numerous services that provide farmers with customised weather forecasts and crop prices through SMS messages, helping subscribers better maximise profits. Another reason it’s good for growth, as set out in this recent IMF paper, is ICT’s ability to provide access to finance for people that want to start up or expand their businesses. But few of us think of investing in ICT as a policy for green growth. Yet there’s a real case to be made for it. According to estimates by the Climate Group, using ICT could cut global business-as-usual emissions by 15% in 2020. That’s more than five times the ICT sector’s own carbon footprint, and a significant proportion of the emissions reductions needed to avoid dangerous climate change. This is because using ICT can drive major energy, water, paper (i.e. forests), and other resource efficiencies in households as well as large and small businesses. Resource efficiency is a key means to boost productivity and profits. ICT also creates the potential for communication, and the creation of new businesses and markets even when physical transport is in a poor state. This will become increasingly important as migration from rural to urban areas in developing countries continues. ICT has incredible reach: it took the radio 38 years to reach a market the size of South Africa (approx. 50 million people), and the television 13 years. But it took the internet just four. Also, as Google’s Ory Okolloh reminds us (who, by the way, is one of my favourite tweeters – follow her @kenyanpundit) using ICT is simply fun! And the more it is used for fun, the more potential it has to contribute to serious development needs. The problem is that investment in ICT in developing countries is below its optimal growth rate. That’s why DFID is supporting governments to invest in ICT infrastructure. For example, we’ve helped invest in the Sea-Com cable to boost broadband coverage in East Africa – by a whopping 700% in Kenya, 850% in Mozambique and 1000% in Tanzania. That’s huge potential that could be unlocked – in countries whose youth populations struggle with very high levels of youth unemployment. But there’s more we can do. So this year, as well as continuing to blog and tweet about my work in DFID, I’ll be helping design a new project that could support the private sector to invest in these and other innovative ideas… Do look out for more on that later this year!